Naama Isabelle Fassbinder, vocals and Anel Ahmetovic, accordion, will take you into a journey in the heart of tango. 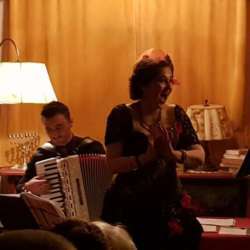 You will enjoy Jiddisch, German and Argentine tangos of the 20's till 40’s and compositions from Astor Piazzolla and Goran Bregovic. Let's leave the cold outside and warm ourselves to this passionate tango evening, which could spark the fire of love!